Synthetic peptide. within Human Hsp27 aa 100-200. The exact sequence is proprietary. Our Abpromise guarantee covers the use of ab215328 in the following tested applications. Involved in stress resistance and actin organization. Detected in all tissues tested: skeletal muscle, heart, aorta, large intestine, small intestine, stomach, esophagus, bladder, adrenal gland, thyroid, pancreas, testis, adipose tissue, kidney, liver, spleen, cerebral cortex, blood serum and cerebrospinal fluid. Highest levels are found in the heart and in tissues composed of striated and smooth muscle. Defects in HSPB1 are the cause of Charcot-Marie-Tooth disease type 2F (CMT2F) [MIM:606595]. CMT2F is a form of Charcot-Marie-Tooth disease, the most common inherited disorder of the peripheral nervous system. Charcot-Marie-Tooth disease is classified in two main groups on the basis of electrophysiologic properties and histopathology: primary peripheral demyelinating neuropathy or CMT1, and primary peripheral axonal neuropathy or CMT2. Neuropathies of the CMT2 group are characterized by signs of axonal regeneration in the absence of obvious myelin alterations, normal or slightly reduced nerve conduction velocities, and progressive distal muscle weakness and atrophy. Nerve conduction velocities are normal or slightly reduced. CMT2F onset is between 15 and 25 years with muscle weakness and atrophy usually beginning in feet and legs (peroneal distribution). Upper limb involvement occurs later. CMT2F inheritance is autosomal dominant. Defects in HSPB1 are a cause of distal hereditary motor neuronopathy type 2B (HMN2B) [MIM:608634]. Distal hereditary motor neuronopathies constitute a heterogeneous group of neuromuscular disorders caused by selective impairment of motor neurons in the anterior horn of the spinal cord, without sensory deficit in the posterior horn. The overall clinical picture consists of a classical distal muscular atrophy syndrome in the legs without clinical sensory loss. The disease starts with weakness and wasting of distal muscles of the anterior tibial and peroneal compartments of the legs. Later on, weakness and atrophy may expand to the proximal muscles of the lower limbs and/or to the distal upper limbs. Phosphorylated in MCF-7 cells on exposure to protein kinase C activators and heat shock. Cytoplasm. Nucleus. Cytoplasm > cytoskeleton > spindle. Cytoplasmic in interphase cells. Colocalizes with mitotic spindles in mitotic cells. Translocates to the nucleus during heat shock and resides in sub-nuclear structures known as SC35 speckles or nuclear splicing speckles. Overlay histogram showing HAP1 wildtype (green line) and HAP1-HSPB1 knockout cells (red line) stained with ab215328. The cells were fixed with 4% formaldehyde (10 min) and then permeabilized with 0.1% PBS-Triton X-100 for 15 min. The cells were then incubated in 1x PBS / 10% normal goat serum to block non-specific protein-protein interactions followed by the antibody (ab215328, 1µg/ml dilution) for 30 min at 22°C. 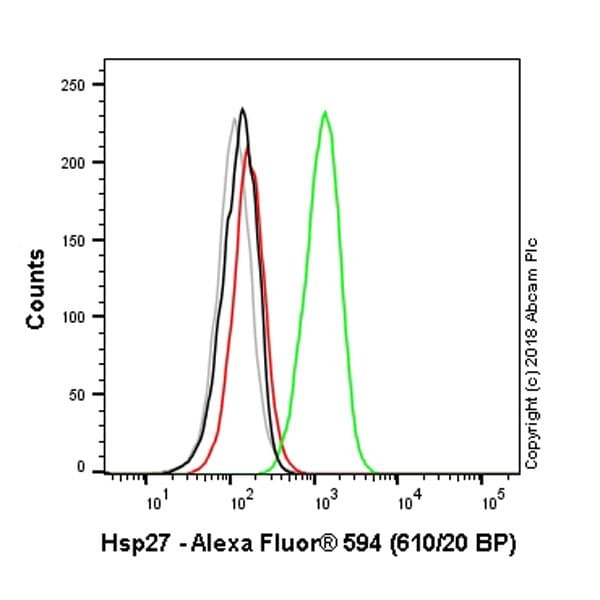 A rabbit monoclonal IgG isotype control antibody (ab208568) was used at the same concentration and conditions as the primary antibody (HAP1 wildtype - black line, HAP1-HSPB1 knockout - grey line). Unlabelled sample was also used as a control (this line is not shown for the purpose of simplicity). 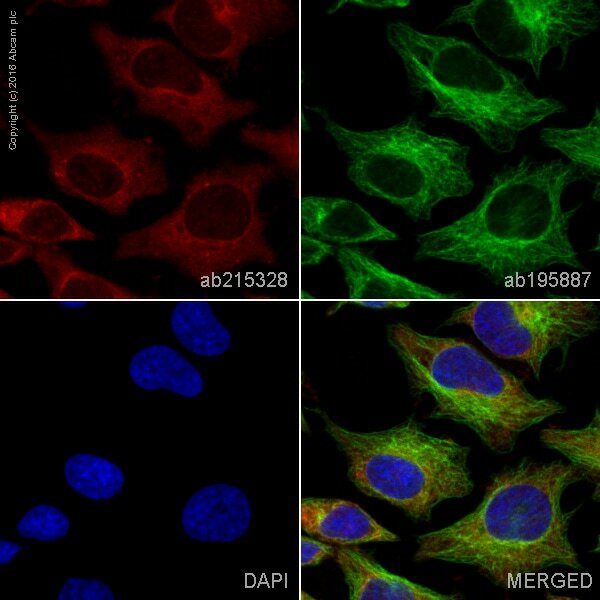 ab215328 staining Hsp27 in HeLa cells. The cells were fixed with 100% methanol (5 min), permeabilized with 0.1% Triton X-100 for 5 minutes and then blocked with 1% BSA/10% normal goat serum/0.3M glycine in 0.1% PBS-Tween for 1h. The cells were then incubated overnight at +4°C with ab215328 at 1/100 dilution (pseudocolored in red) and ab195887, Mouse monoclonal to alpha Tubulin (Alexa Fluor® 488), at 1/250 dilution (shown in green). Nuclear DNA was labelled with DAPI (shown in blue). ab215328 has not yet been referenced specifically in any publications. Publishing research using ab215328? Please let us know so that we can cite the reference in this datasheet. There are currently no Customer reviews or Questions for ab215328.